Mahendra Singh Dhoni is the brand ambassador for the construction sector giant Amrapali Group. 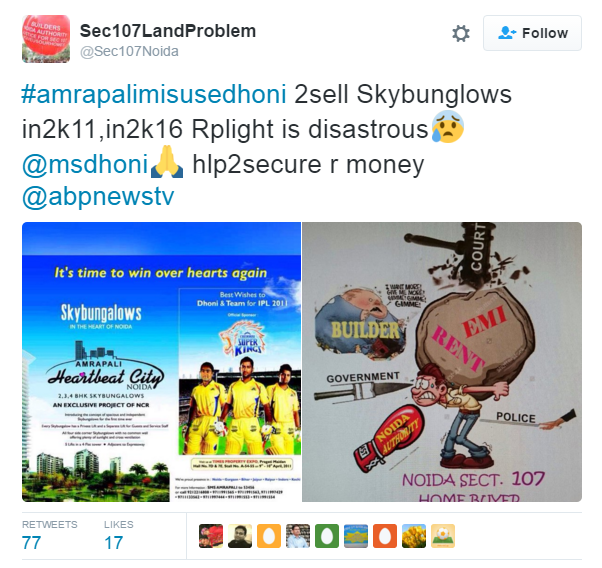 On April 4, 2016 a campaign #AmrapaliMisuseDhoni was started on Twitter to protest against the alleged delay in completing of the Sapphire Project in Noida by Amrapali. It has since gone viral with a number of residents taking up their cause on social media. The construction of the project started in 2009, and although possession has been given to a number of families, residents say the civil and electrical work is still pending in a number of towers. Amrapali Sapphire (Amrapali Sapphire Developers Private Limited) offers 2-3-4 BHK apartments and penthouses in Sector 45 Noida. It is a joint venture between Ultra Home Construction Private Limited and Bihariji Ispat Udyog Private Limited, the other shareholder being ICICI Prudential Asset Management Company. The construction which started in 2009 is still underway at some of the towers. Construction companies in general are facing slow market and lack of funds. We took a closer look (due diligence) at the company financials to understand the health of the company. As per the Director’s Report of the company available with the Registrar of Companies, the turnover stood at INR 182 crores in FY 2013-14 compared to INR 229 crores the previous fiscal. The company has not filed their latest financials. Profit for FY 2013-14 stood at INR 5.4 crores against INR 6.98 crores in FY 2012-13. The Debt-Equity ratio stood at 24.7 in FY 2013-14 as against 30.3 in FY 2012-13, which is normal for a construction company. Notably, Dhoni is not only the brand ambassador of Amrapali Group, but his wife Sakshi Singh Dhoni is a Director in Amrapali Mahi Developers Private Limited, a joint venture between Dhoni and the Amrapali Group. Anil Kumar Sharma who serves as the CMD of the Amrapali Group is the other director and holds 75% shares in the company. Sakshi holds 25% stake in the venture. Responding to the Amrapali issue, Dhoni said that promises need to be met. He also mentioned that it has become difficult for the builders in the current economic scenario. Following the controversy, Anil Sharma issued a statement saying only 4-5% work is pending which will be completed in 2-3 months.